The Real Home-made by guest post Jenny Zhou’s story of summer in Southwestern China, staying with relatives who grew soybeans. 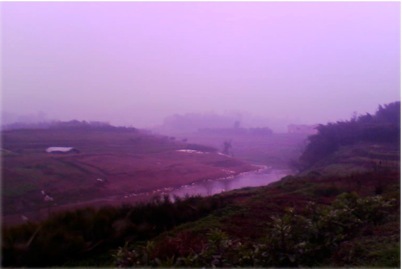 The river, the fields and bamboo forests. The water used to be crystal clear. The university cafeteria lunch I bought today was the same as usual: rice, already-cold cabbage and a once-warm chicken leg, cooled by the November chill. Walking toward my dormitory, it occurred to me how strange it is that I should eat these foods miserably, repetitively, almost every day in Beijing. I was possessed with the impulse to buy a ticket back to Chongqing. How I wish I could feel the heat and smell its authentic foods again! I ran down the mud road to catch him. In those days, there were only rivers, green mountains and bamboo forests there, and fields, some along the bank and others halfway up the mountain, the terraces typical of China’s mountainous southwest. The boy led me to the middle of vegetable fields. All around us, newly weeded, were soybeans, chili peppers, corn, eggplant, tomatoes and white gourd. “I bet you’ve never seen this before?” he said, laughing at all the vegetables surrounding us. When I got back at sunset, my aunt told me we’d be making tofu in the morning. “Do you want to come and watch, Tingting?” she asked me. I was curious, and excited. The woman in red is my mother. My aunt was always the first one up, preparing breakfast when it was still dark. She was short, but she handled big things well. By the time I woke up, she was already outside in the yard, where I heard shouting: “Push! One, two, three!” I dashed out of the bedroom upstairs and was amazed by what I saw. One man was pushing around a big machine, enormous round grindstones that looked like a two-layer cake cycling horizontally, while another used an enormous iron spoon to spread soy beans into a small hole carved in the center. When the beans fell into the hole, they were shredded and juiced. They had been soaking in a bucket of water over night, so they would produce more juice. Less than an hour later, when we had a bucket half full of bean juice, my aunt took out a big flat pot. She poured the juice in the pot, adding hot water from a ceramic bucket. My uncle carried the pot back to their dark kitchen and brought it to a boil on their stone stove, which he fed with straw and firewood. I followed my uncle into the dark, where I could smell the dust and straw. Watching his figure lit by the fire, I helped him add more firewood. He was a tall man fond of talking and smoking. The villagers all thought highly of him for how hard he had worked, years ago when farming was all done by everyone together. After half an hour, he lifted the lid, and with a big smile, added something and stirred it a little. Magically, the juice became a delicate solid. The addition was danshui, which makes the juice solidify. I tasted the tofu moments later. I’ve never forgotten the way the fragrance of fresh beans stayed in my mouth. I just kept eating it, with sauce my aunt had prepared. The fresh tofu was like eating the bean fields, the chase through the mud, the plough man, the river running river along the country road, the humid heat of Chongqing in July. I think of Chongqing summers now, in cold Beijing. I miss the beauty of the terraced fields, and making food from the very first step. Eating my cold lunch quickly, food from factories, something in me isn’t satisfied. I’m surprised that my classmates don’t know the name of the vegetables when we’re buying meals at the cafeteria. I’m surprised that they don’t seem to care to know how their food is made. They laugh at people who come from the countryside. If they’d made tofu as I had, would it make much difference to them? If they saw the time and care my aunt and uncle put into growing vegetables and producing food? I miss the sense of happiness I had with them, of being happy being right where I was, using nature’s gifts wisely. I want to know my aunt and uncle’s self-reliance–to know what I’m capable of. I’m hungry for the taste of real home-made tofu. Salt (a lot), fried chili pepper powder, pepper oil, cooked seed oil, chopped Chinese onion (the thin and small one) —- all of these put in a small tray, no need to stir them. Tips: never put any water in the sauce because the salt will melt. Vinegar and soy bean sauce will also be unnecessary. That’s not the way to eat this kind of tofu.